Relationships are all about people. Relationships are typically either good or bad; rarely are they ambivalent. As such, people and the relationships that are formed have the ability to make an exchange experience remarkable or just run of the mill and easily forgotten. Based on our experience to date, after having been the recipients of Australian generosity and kindness, we can unequivocally state that our exchange has been incredible. We first experienced Australian geniality when we arrived in Sydney. As you may recall from the second blog entry, we were at a loss as to what we would do with our excess luggage and how would we be able to transport it to Kadina. “Peter” came to our rescue and soon sorted out the logistics of ensuring that our luggage would be delivered safety at its destination. Consequently our holiday time in Sydney didn’t miss a beat. 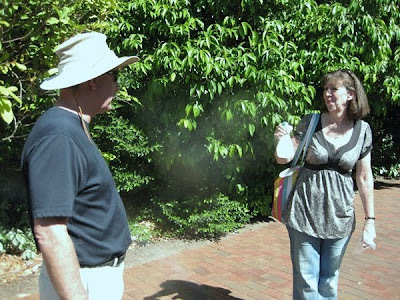 Next, our “Exchange Buddy – Jill” met us at the airport upon our arrival in Adelaide. We first met Jill, while she and her son Michael were on a teacher exchange to Edmonton in 2003. As part of the teacher exchange program, incoming teachers are matched up with an exchange buddy. The exchange buddy is assigned with the task of assisting the incoming teacher (i.e. ; Gail and by default Rick) to adapt to their new and unfamiliar surroundings. The fact that we have already met Jill in her previous life as a newbie exchange teacher while in Canada made our welcome in Australia a re-acquaintance with an old friend. Subsequently, we have spent a number of weekends with Jill touring the wine valleys, shopping, visiting restaurants, and familiarizing ourselves with Adelaide. “Leon” who has the patience of Job has been a God send for us. If we are ever in doubt about anything, Leon is there to steer us in the right direction and not lead us astray. Leon already had a car picked out for us prior to our arrival in Kadina. 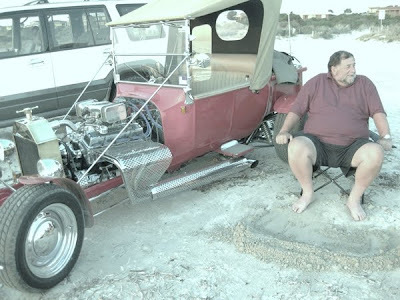 Given the fact that he has built a “Hot Rod” from the ground up, we had nothing but confidence in his securing a vehicle for us. Leon has also cooked, and has promised to cook, a number of curry meals for us. We are quite excited about this as we have limited experience with cooking curry dishes. On the other hand, Leon is starting to enjoy our “drip coffee” rather than the instant coffee that is commonly served in Australia. “Doug and Dawn” have taken us under their wing and are showing us everything they can that is “Australian”. For example, arrangements are being made so that we can tour a sheep “station” and perhaps sheer a couple of sheep. In addition to touring a number of wineries with them, we are also scheduled to go on a camping trip to the Outback in June. 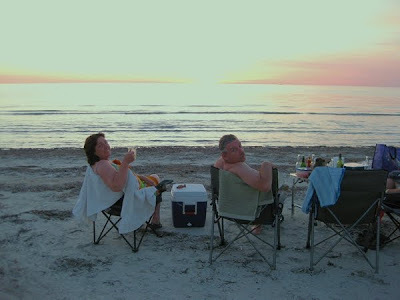 With Dawn and Doug, it is starting to become a routine thing to go down to the beach on a Friday night to swim, sit and enjoy a bottle of red as the sunset disappears below the ocean and washes the weekly woes away. The "Boys" getting ready to go Crab Raking. Doug is applying Sun Screen while Rick and Leon are ready to go. The Boys walking out to get their catch. 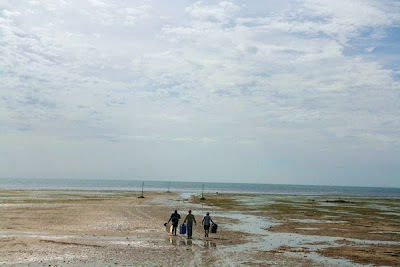 Unfortunately we got skunked that day as only two crabs were caught. "No worries Mate" because the journey was more enjoyable than the conquest. Leon taking a picture of Gail posing for the camera. Doug and Dawn are more interested in the ice cold Corona with a slice of lime. “Scott and Allie”, like the others mentioned above, have opened their homes and hearts to us. They have been so warm and friendly to include us in their day to day lives. 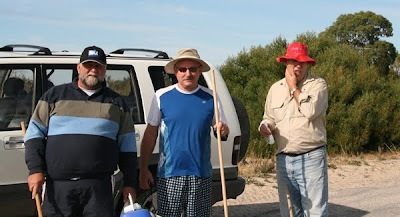 Scott has taken Rick on a number of “road trips” to various towns located within a 2 – 3 hour driving distance from Kadina. 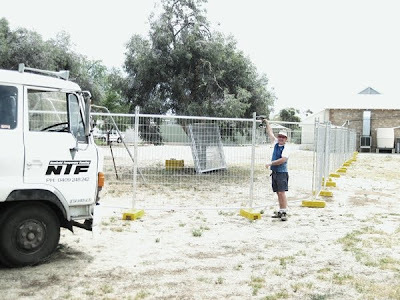 Scott is in the business of erecting portable fencing and has taken Rick on the odd job as his “lackey” or “grunt”. Rick is of the view that Scott is quite comfortable with the arrangement because Rick has noticed that Scott now has no problem sitting in an air conditioned truck talking to the site foreman while his “lackey” is outside in +36oC putting up the fence. On the other hand, Rick is quite comfortable going down to Scott’s wine cellar and picking out a couple of bottles of red which is shared over an excellent BBQ meal that Scott has prepared. It seems like both of us think we have the better part of the deal. 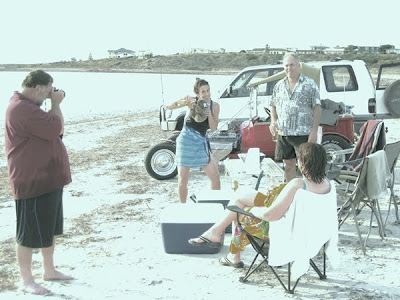 Are you getting the sense that part of the South Australian culture is to open and enjoy a bottle of wine with friends? Rick putting up the portable fence. Where's Scott? At work, the teachers at Gail’s school have been extremely accommodating and helpful. In Canada, Gail is solely responsible for teaching foods. In Australia, the teaching of foods is shared between three teachers. Consequently Gail’s teaching assignment also includes teaching classes in English and Social Studies. Without the able assistance of the other English and Social Studies teachers helping Gail with the curriculum, Gail’s preparation time would be exceedingly onerous. The parents of our exchange partners have also been warm, kind and very generous. While in Adelaide, we have been invited to stay with them, as well as park our car at their place rather than at the airport, while on extended holidays. We have been made to feel very much a part of the “family”. The list of Australian hospitality could go on and on. We think you get the gist how relationships make a successful and memorable exchange.